The Organisation for the Prohibition of Chemical Weapons (OPCW) has released its investigation into the agent used to poison former Russian spy Sergei Skripal and his daughter Yulia Skripal in the UK city of Salisbury last month. It has essentially confirmed the findings of UK government scientists, saying a ‘Novichok-type’ nerve agent was used, but has not released any specific detail on the identity or structure of the compound. The UK government asked the chemical weapons watchdog to investigate following the incident on 4 March. 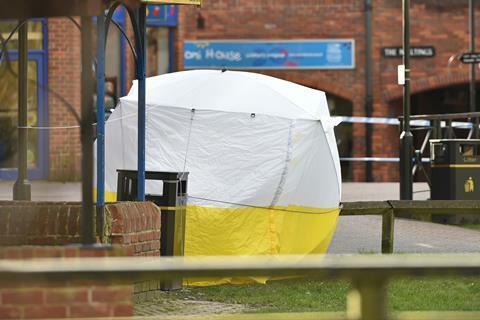 Analysis by UK scientists at the Defence Science and Technology Laboratory at Porton Down found that the compound used in the attempted assassination was one of a family of nerve agents called Novichoks that were developed by the Russian military. The OPCW says a ‘highly purified’ Novichok-type nerve agent was identified in samples taken from sites linked to the poisoning. Investigators noted the ‘almost complete absence of impurities’ in the nerve agent samples. Breakdown products consistent with a Novichok agent were also found in blood samples taken from both victims. All samples were collected under supervision from OPCW inspectors and were analysed at four designated laboratories, with two handling the environmental samples and two the biological ones. ‘The picture that has emerged today will not add to the police investigation but it confirms the nature of the agent they are dealing with,’ says Alastair Hay, a toxicologist and chemical weapons expert from the University of Leeds, UK. ‘The high purity of the substance will strengthen the UK’s position that the agent was made by a highly proficient team and in a well refined process.’ He adds that it is possible this nerve agent and its derivatives will now be added to the list of chemicals restricted under the Chemical Weapons Convention. ‘Having received vindication of its position, the UK may now wish to give other state parties time to consider the implications of the latest findings and reach a consensus on how to proceed,’ Hay says. The UK government has accused the Russian authorities of poisoning the Skripals, saying that Russia has both the technical know-how to make the nerve agent and the motive to carry out the attempted assassination. The fallout from the incident has resulted in the largest expulsion of Russian diplomats ever by the UK and its allies. Meanwhile, Sergei Skripal remains in hospital but is said to be recovering. Yulia Skripal has been discharged. Which Swiss finding is this? I'm not familiar with it. How about the Swiss finding????? It appears to me you're more interested in politics than chemistry. When will the UK give a sample to Russia as international law dictates??? ?